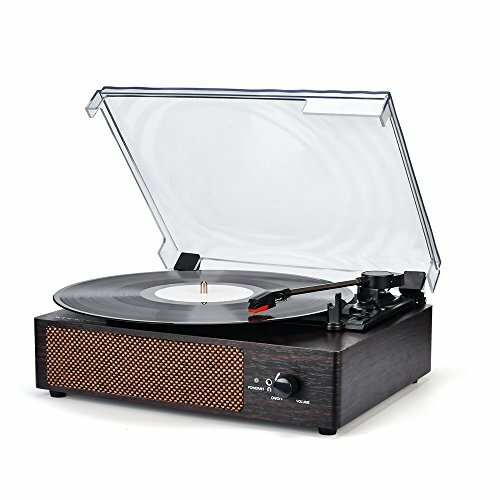 Save an additional 5% on Record Player Portable Bluetooth LP Belt-Drive 3-Speed Turntable with Built in Stereo Speakers, Vintage Style Vinyl Record Player (vintage style-brown). Discount applies at checkout. Why play old things in the digital age? Because of the kind of empty inspiration and sense of presence is the CD can not be replaced. Let wockoder turntable take you to the front row of a concert, and immerse you completely in the music. Looks good and feels good. This is the vinyl experience built just for you. Compact, portable record player , Antique design, Solid Wood Appearance, it is a very nice decoration for the living room or bedroom. 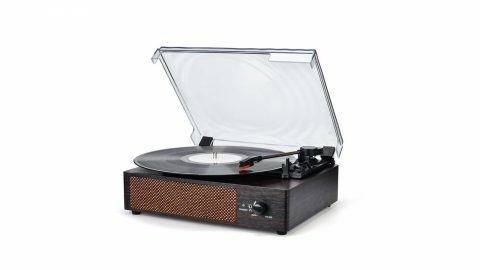 Three-speed turntable (33 1/3, 45, 78 RPM) plays all of your vinyl records. The belt-drive absorbs motor vibrations and noise. Bluetooth transforms your turntable into a great wireless speaker. Choose your favorite music and play it directly from your smart-phone or tablet. HAVE NOT ENOUGH VINYL RECORDS? Antique design, Solid Wood Appearance, it is a very nice decoration for the living room or bedroom. Collocation thick dust cover all show atmosphere.